I'm HOME! ;) I got in at midnight last night. And I had the BEST time. Cindy, Jessica and I shopped, ate, laughed and played. It was so much fun getting to spend time with them. I also had the chance to meet up with lots of other people for the first time. It was so great meeting them in person!! Aside from one little blister, I did pretty well. I think the fact that the show is on the east coast made it a lot easier. In the past, I've taken the red eye home from California and am DEAD for the next few days. So, where to begin. There were lots of great new products. It was so much fun helping Cindy pick out what to get at Emma's. She's getting tons of new things. Most of it will be shipping soon, too! 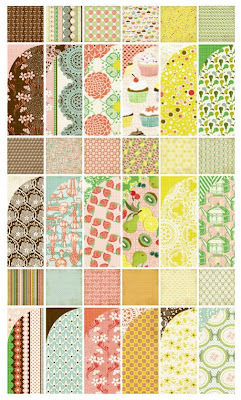 First is Basic Grey's Nook and Pantry line. I'm in LOVE with this one!!! The samples at the BG booth were to die for!! If I can figure out what's up with my camera, I'll post them later. I also loved the new Victoria line from 7 Gypsies. 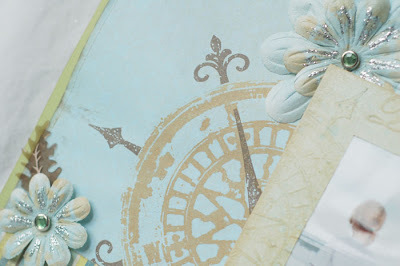 This next one is from Crafty Secrets. They have little sets that you can make mini books or other items from. The samples are darling. 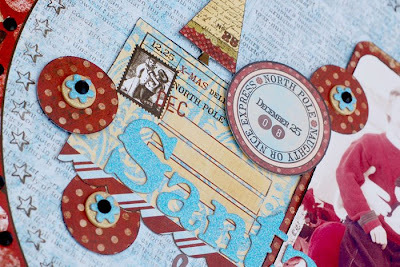 I love that the sets come with chipboard, papers, and stamps. CUTE!! Next up is Pink Paislee. I absolutely adore the new lines. And I'm so excited that I was able to make some layouts for the booth using it. I love all four collections, but Cupid is my absolute favorite! Finally, there was Prima. I can't even tell you how gorgeous their stuff was!! The booth was dripping with inspiration and pure eye candy! The layouts were ALL little works of art! Here are just a couple of things that I loved. 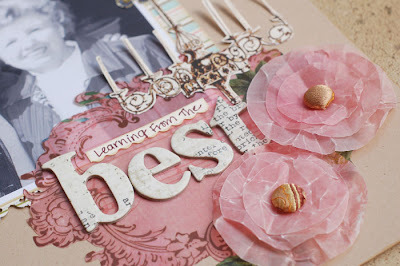 I'll leave you with a couple of my Pink Paislee layouts. 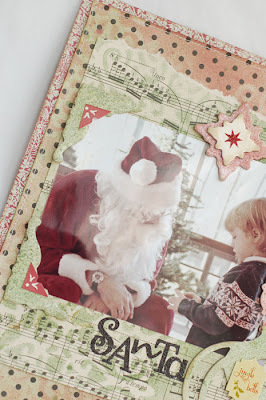 This first one uses the Mistletoe & Co. line. And this one uses the Cupid Line.. I'm so excited that I can finally share my new Webster's pages. 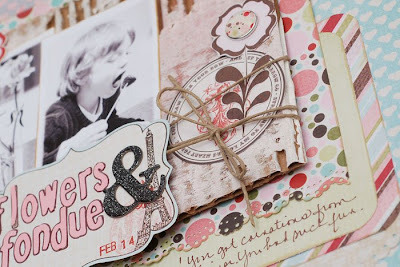 These pages both use the Postcards from Paris line. I love it!! This first page is about one of our recent zoo trips. I couldn't believe that I had pictures that matched the papers so well. Who'd have thought that I'd have hot air balloons and peacocks from one event?? And this next one is my favorite. I love this photo of my mom and me. 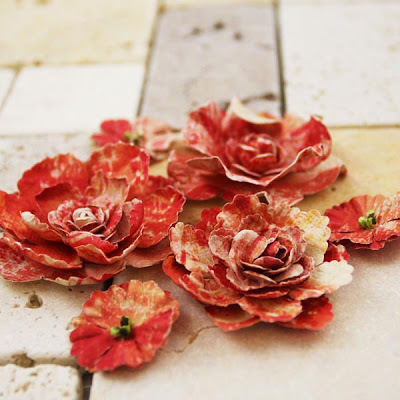 I made the flowers from the vellum paper in the line. I cut the circles, scrunched and inked them and added a brad. You can see Webster's full release HERE. 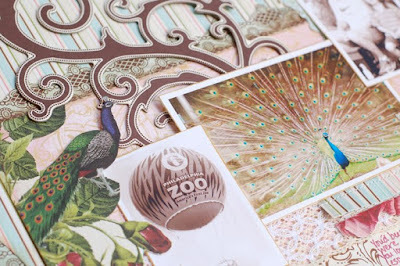 I'm in love with the new papers and the embellishments are to die for! And if you want to see the rest of the teams work with the Postcards line, go HERE. You'll really be in for a treat! Finally, Inspire Me is having a race to get 1,000 members. Check out the information HERE. You could win one of the new collections! So, I'm finally done with my CHA projects! Yay! Everything is mailed off or packed and ready to go with me. Speaking of CHA, a couple of posts ago I wrote asking for shoe advice. Thanks to everyone for your awesome ideas. There are so many cute shoes out there! I ended up going to the mall yesterday. (The little guy had to endure 3 1/2 hours of shopping!). 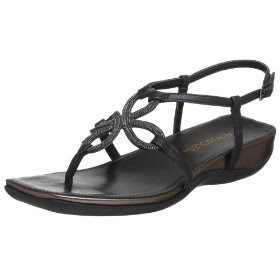 I found a cute pair of Aerosoles. They are super comfy and really cute. So, now I'm all set! I don't think I've owned yellow shoes, EVER! But they were so cute. So, I HAD to splurge on this skirt. I love it! Well, enough of my shopping endeavours.. onto some projects. 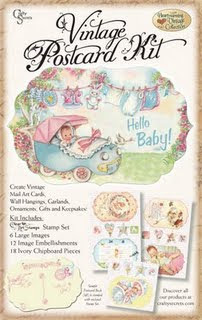 This one is a layout I did for Tattered Angels. 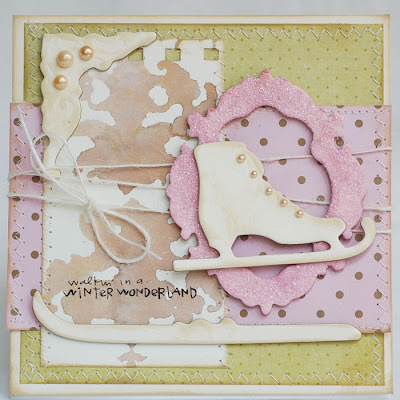 I used the new chipboard Tiles, Bingo Boards, Compass stamp and Glimmer Mists in Caramel Apple, Frost, Frozen Lake and Sand. I love the quote on here! It says, " A journey is best measured in friends, rather than miles." 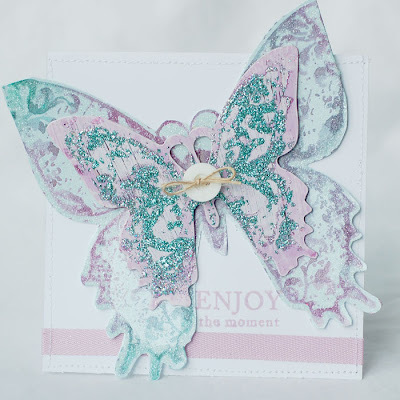 Here's another version of my butterfly card. 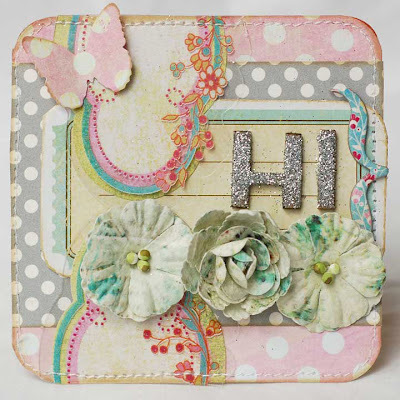 This next card uses the new big butterfly stamp. I love it! 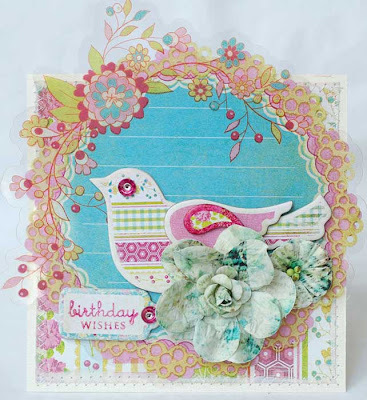 I sprayed Pashmina and Frozen Lake onto the card. Then stamped it. It gives a great 'watercolory' effect. 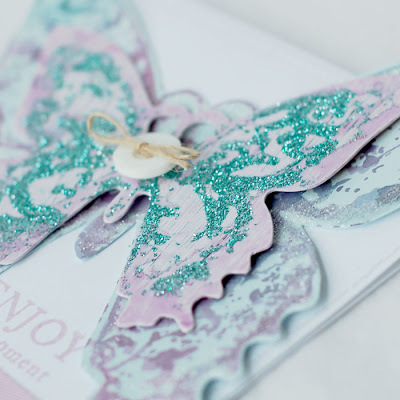 I cut out the butterfly and adhered it to the card. Then I painted a piece of butterfly Glimmer Glass white. I added Pashmina mist once it dried. 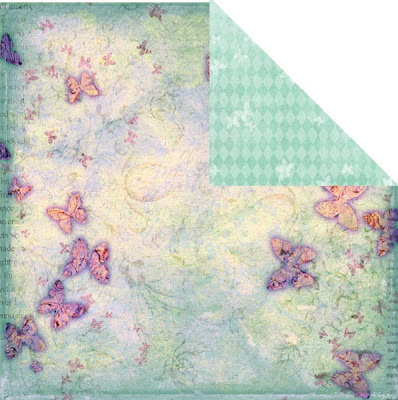 Then, I painted a butterfly Glimmer Screen with mod podge and stamped that onto the glass. Next, I sprinkled glitter onto it. I like how it gave it a textured butterfly pattern! Well, that's all for today. Thanks so much for stopping by! CHA is coming up next week. I'm so excited. I love seeing all of the new products and deciding what I want to play with next. My list is growing each day! 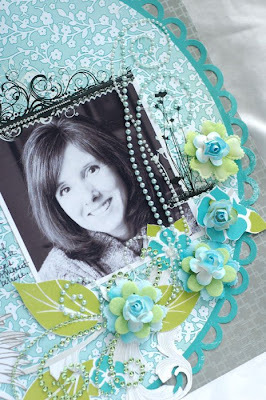 This first one uses the new pearl flourishes in light blue and a new pale green crystal flourish. 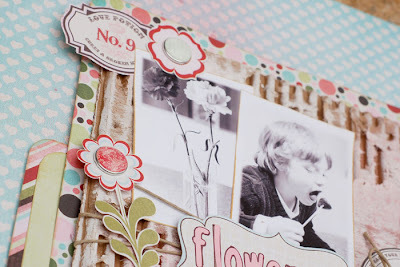 Some of the new release flourishes are longer and work great on 12 by 12 layouts. ;) I added some Zva flowers on here, too! 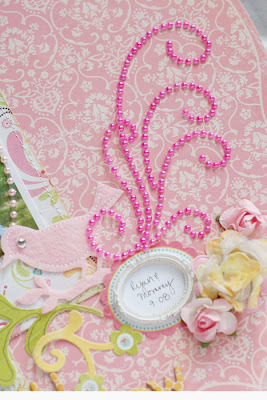 This next layout uses some of the pink pearl flourishes and the new pearl bracket. So fun!!! 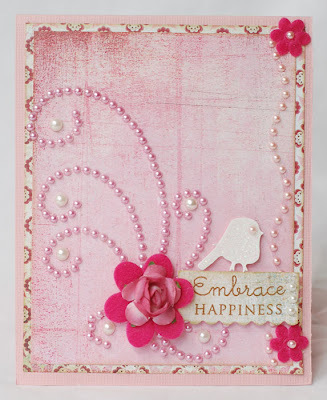 Here are a couple of more cards using the pearl flourishes and pearl ovals. 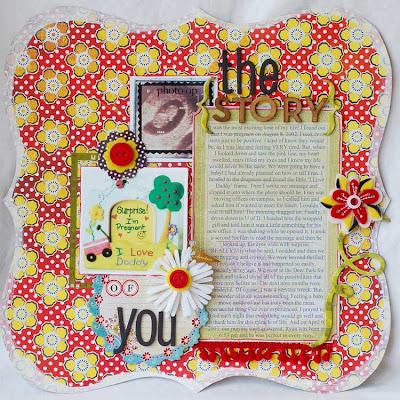 In the above post, I shared my Label Tulip challenge page, to scrap the most exciting thing you've done. Well, the challenge is posted on the Label Tulip site now. Check it out HERE. There's a great RAK involved. 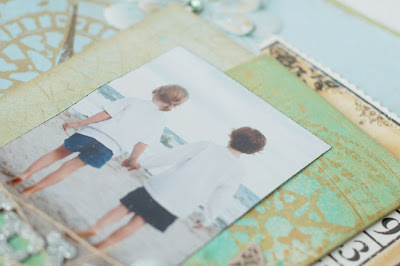 You can participate in the challenge without even using the kits, so give it a try! Here are my last two projects from the July kit. 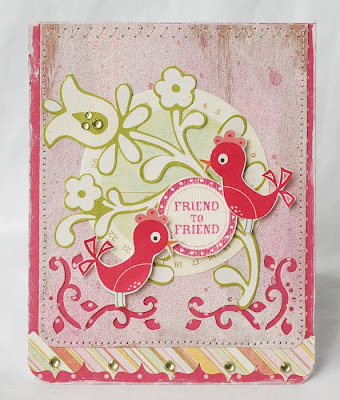 The first is a fun card I made using Basic Grey and Prima. Aren't these colors the best? 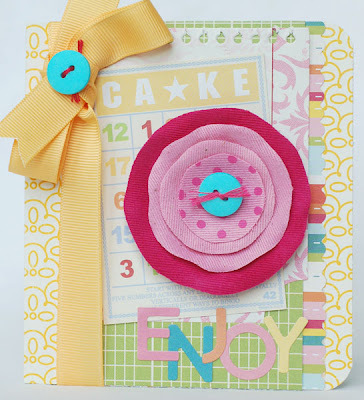 This next one is the card I made to go along with this month's member lift. 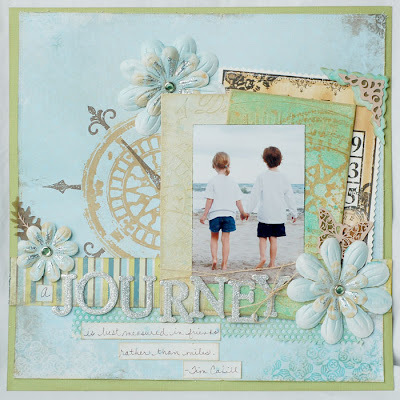 We lifted a beautiful page by Amy Coose. I decided to create a card from it. 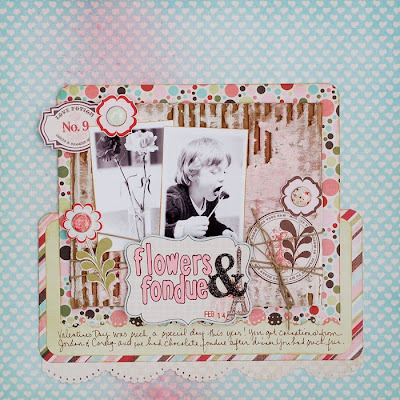 I love how you can get ideas for cards from layouts and vice versa. 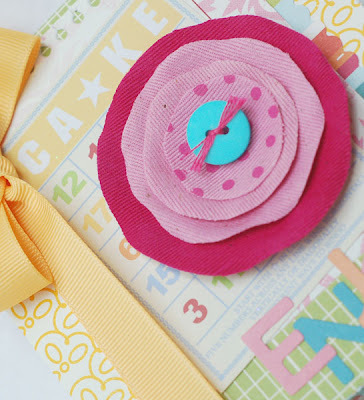 I decided to use flowers for the circles and I cut the BG transparency/journaling tag in half. I also added glitter to the MM wooden letters. Well, that's it for now. Thanks so much for stopping by! 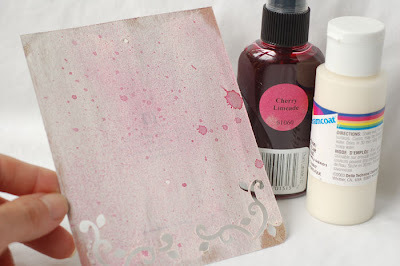 Label Tulip's July kit was revealed last night and it's wonderful! The main kit is filled with goodies that are perfect for both a travel/journey theme or any other summer time adventure. Here are the layouts I did for this month. I'll share the cards, soon. 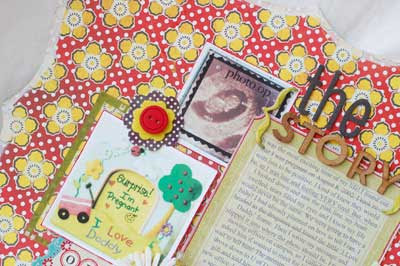 This first one uses some Little Yellow Bicycle and October Afternoon papers. The transparencies are LYB, aren't they fun? I love the colors on this next one. I used Fancy Pants, MM and Basic Grey papers. 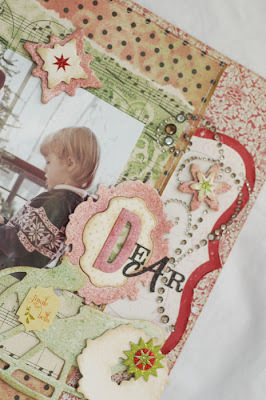 The chipboard is BG and the journaling card is October Afternoon. Finally is this page. I don't usually do pages with lots of journaling, but I did on here. 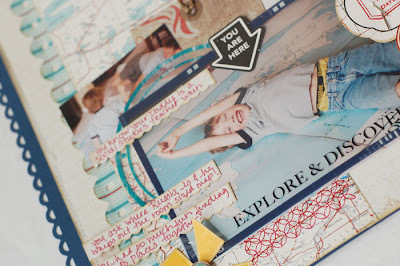 The challenge this month was to scrap the most exciting thing you've done in your life. I wrote about the day I told Fran I was pregant. Here's the journaling if you have any interest. I cut the page using another paper as a pattern and painted the edges. It was the most exciting time of my life! I found out that I was pregnant on August 8, 2002. I took two tests just to be positive. I kind of knew they would be, as I was late and feeling VERY tired. But, when I looked down and saw the pink line, my heart swelled, tears filled my eyes and I knew my life would never be the same. We were going to have a baby! I had already planned on how to tell Fran. I headed to the drugstore and found the little ‘I Love Daddy’ frame. Then I wrote my message and slipped it into where the photo should be. Fran was moving offices on campus, so I called him and asked him if wanted to meet for lunch. I couldn’t wait to tell him! The morning dragged on. Finally, I drove down to U of D. I handed him the wrapped gift and told him it was a little something for his new office. I was shaking while he opened it. It took a second for him to read the message and then he looked up, his eyes wide with surprise. “REALLY?” is what he said. I nodded and then we were hugging and crying! We were beyond thrilled! I couldn’t believe it had happened so easily, especially at my age. We went to the Deer Park for lunch and talked about all of the possibilities that were now before us. The next nine months were wonderful. Of course, I was a nervous wreck. But, the wonder of it all was astounding. Feeling a baby move inside of me has truly been the most spectacular thing I’ve ever experienced. 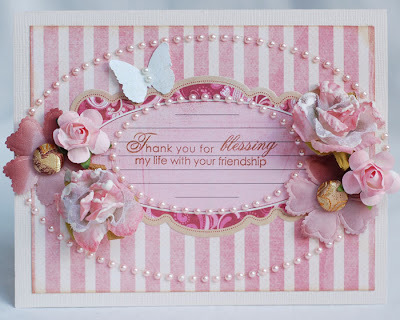 I prayed to God each night that everything would go well and to thank him for this miracle of life. And on April 9, 2003, our prayers were answered. Ryan was born at 6:53 pm and he was perfect in every way. Thanks for checking them out. You can see the rest of the amazing DT gallery here. It's hard to believe that we are halfway through July! Where is this summer going? I have to say, the weather has been awesome. No humidity, days that have been around 80degrees and comfortable evenings. We haven't had to turn the air conditioner on at all, which I'm thrilled about! How has the weather been near you? Well, here is a card for this week's CPS sketch. 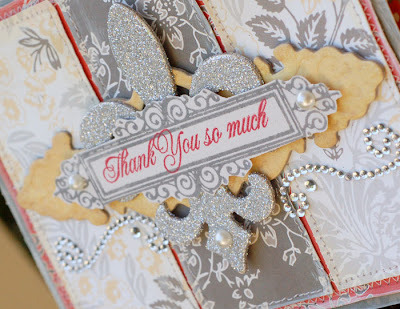 As you know I love Papertrey Ink. 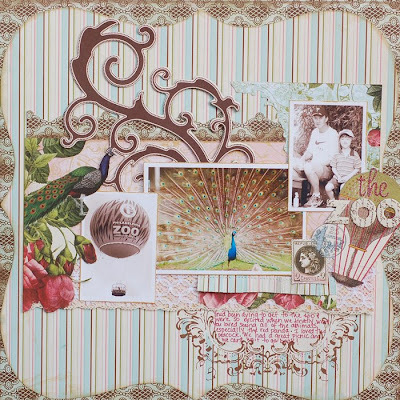 Everything on here is PTI, the ribbon, ink, stamps and buttons. The butterfly was cut with my Cricut. I love Lemon Tart and Sweet Hibiscus together. And this is another one that I did recently. I love the colors on here. I used the Cosmo Cricket paper as my inspiration. I sprayed the Tattered Angels chipboard with Sunflower Glimmer Mist and the crystals and pearls are Zva. 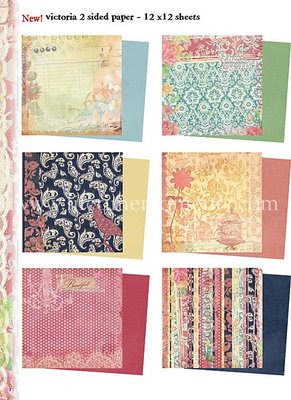 The stamps are, of course, Papertrey! I'm gearing up for my trip to CHA. So, here's my question for you. I need some cute, yet comfy shoes to wear. I want something that looks stylish, yet will cradle my tootsies. ;) If you know of any, link me up! Busy, busy, busy, just can't share yet. 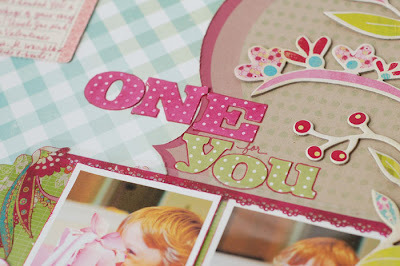 ;( CHA time is always so much fun because I get to create with some new goodies. But not being able to share is always so frustrating! Soon enough, though. In the meantime, I thought I'd post a couple of things I've done for Emma's recently. 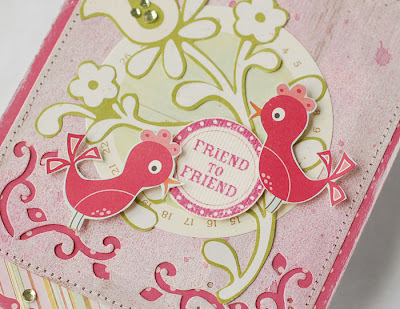 This first card is a fun one using some October Afternoon, Jenni Bowlin and Prima goodies. 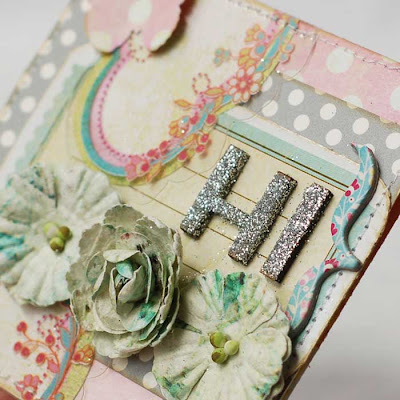 This next card uses a piece of packaging from Prima flowers. I painted it then sprayed it with Cherry Limeade Glimmer Mist. I love the shabby feel of it. 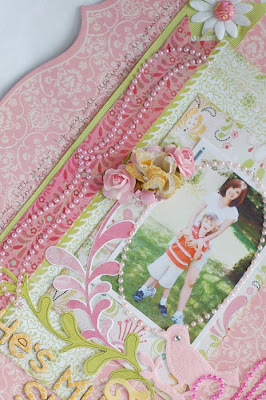 The cut outs are from Ocober Afternoon and Cosmo Cricket papers. Be sure to stop by Label Tulip, if you havne't yet done so. There's lots of fun challenges and some GREAT giveaways going on. It's Christmas in July! I've been busy working on a few projects for the Tattered Angels booth. I'm excited to share a couple of them with you. 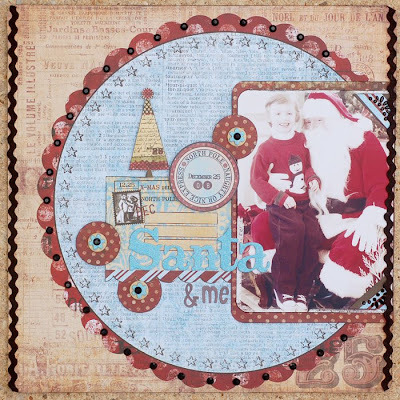 First, is a layout that I used Frosty Memories chipboard on. I also used the Regal font. The red is from the new Fall line and it's called Indian Corn. It's a gorgeous color! The green is English Ivy. I spritzed it on the music and polka dotted paper and I used a snowflake Glimmer Screen with it. 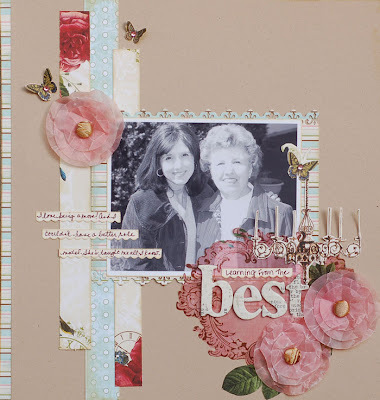 Next up is a card that I made using the same Frosty Memories chipboard. 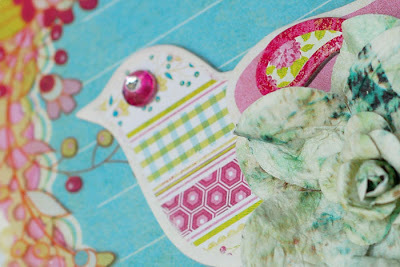 On this card, I simply added some ink to give it a shabby look. 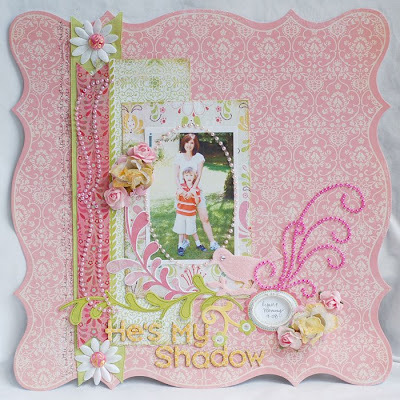 I sprayed the Regal Font frame with Sherbet Glimmer Mist and added some glitter. 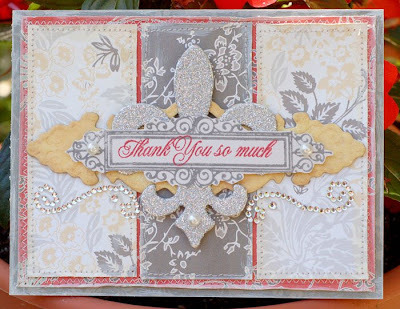 I used a beautiful new Fall color, Caramel Apple on a damask stamp to create the patterned paper you see. 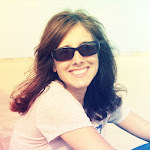 Tattered Angels is having some fun giveaways this month. Definitely head over to the TA blog and find out how you can win some of the new releases!